So it would make sense to invest in keeping everyone healthy. Yet in the US, it’s common practice to treat people only after they get sick—which kind of makes sense given the way we deliver healthcare. 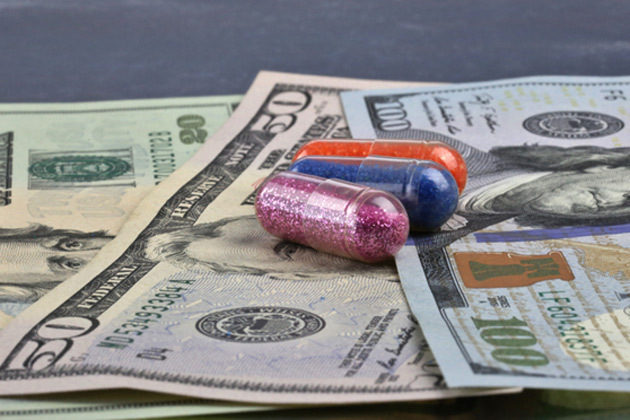 Pharmaceutical companies and healthcare providers get paid for delivering services to the sick. They make nothing from healthy people. Combine that with a payment system that gives patients no incentive to seek lower prices—and even prevents them from doing so—and it becomes obvious why we spend way too much. Follow the money, and you’ll see many of our economic problems are really healthcare problems. And they’re slowly consuming the whole economy. Wise consumers want the most for their money—but when the product is healthcare, Americans aren’t getting it. Here’s a chart I showed back in March 2017. 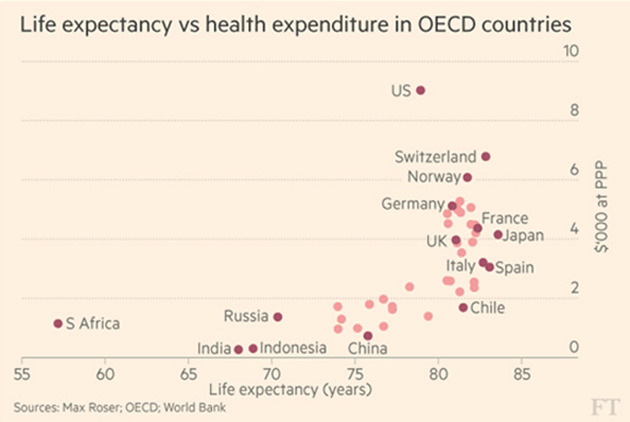 It plots life expectancy vs. per capita healthcare spending in the OECD member countries. The lower-right area is best. That means your country gets the highest life expectancy for the money it spends on healthcare. Japan, Chile, and most of Europe are in that quadrant. The US is located much higher, and a little bit more to the left, than our developed-world peers. We spend far more money on healthcare, but it seems not to buy us any additional years of life. In technical economic terms, we call this “bananas.” It makes no sense at all. Americans spend massive amounts of money for… nothing. But it’s not nothing to the people who receive that money. Physicians, hospitals, drug companies—all make nice incomes. The rest of us pay them, and the amount has been rising fast. 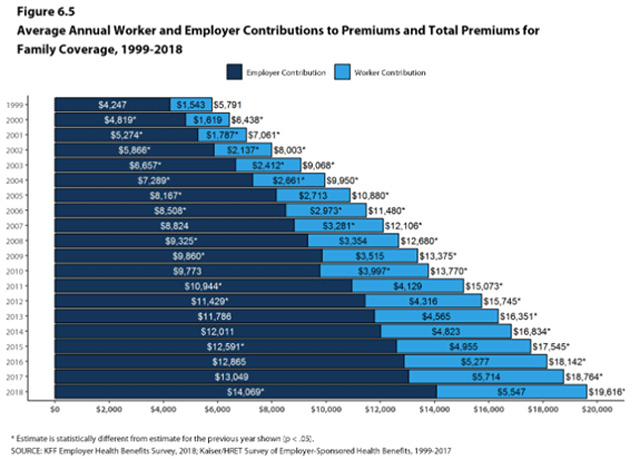 Here’s a chart from Kaiser Family Foundation showing the cost of family health coverage through an employer, broken down by employer and worker contributions. 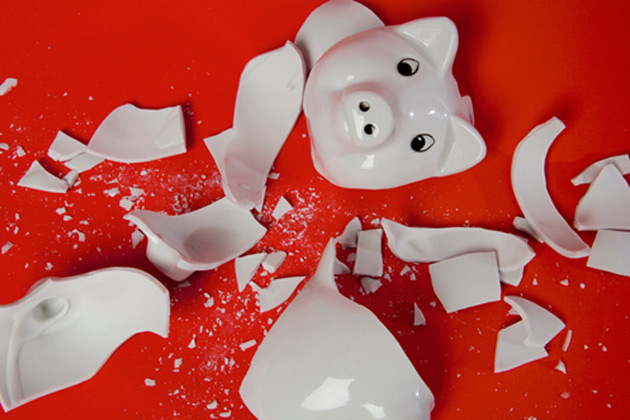 This year, insuring one family costs $19,616—composed of $14,069 from the employer and $5,547 from the worker. But economically, the worker really pays it all. The employer contribution is simply more compensation (which thankfully doesn’t get taxed). Health insurance costs 239% more today than it did in 1999... but we’re not 239% healthier. And that’s just the premiums. 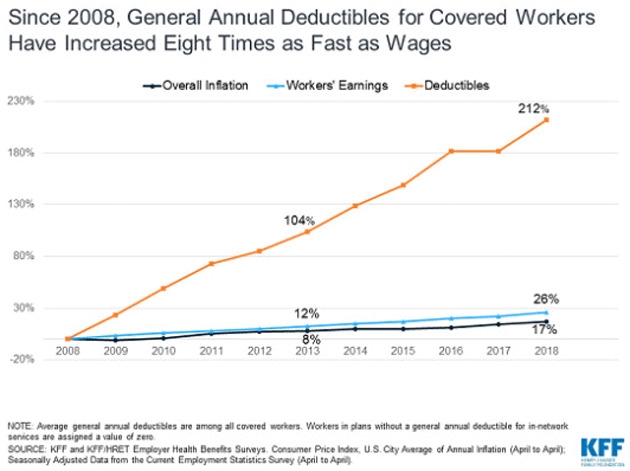 Look how fast deductibles are rising. So we spend more on premiums, and those unlucky enough to get sick spend more out of pocket. And wages haven’t kept up, so the pain is increasing. People without employer-provided insurance are the worst off. If you make too much for Medicaid and have to buy an ACA plan, you probably pay even higher premiums for worse coverage. This is causing significant economic damage. According to the US Census Bureau, median household income was $61,372 last year. Add in employer healthcare benefits as a kind of phantom income, and it’s really more like $75,000 (for those who have employer coverage). We saw above that the average cost of employer healthcare coverage is $19,616. So the typical household spends nearly a quarter of its income on health insurance. That doesn’t happen in other developed countries—it’s a uniquely American problem. Whether you are on Medicare, Medicaid, ACA plans, or uninsured, someone covers or subsidizes your care. The money gets sucked out of the economy, one way or another. With healthcare at 18% of GDP, it looks to me like private employers are paying too much to cover their workers, and the government pays too little to cover poor, elderly, and disabled people. And many people who need care don’t get it. But whether you pay 18%, 25%, or something in between, it’s harming US productivity. We should be spending that money on other things, as our global competitors are. To have a growing economy, you need productive workers. The impact of sickness varies: Some people with health conditions keep working. Others can’t work at all. Others try to work but are often absent and therefore less productive. It affects families too. If someone’s spouse gets cancer, the worker may be perfectly healthy, but won’t produce as much. Then there’s the time we all spend dealing with healthcare, even if we aren’t sick. You have to pick your insurance plan, find in-network providers, repeatedly give your information to different doctors, and so on. Those hours don’t show up as a “cost”—but across the population, they are a serious drag on productivity. The good news is, it’s not rocket science. Other countries deliver better outcomes at lower costs. What we lack in the US is the political will to make major changes in such a huge economic sector. Which is understandable because the money you or I deem “waste” represents someone’s job or revenue. This is really similar to the automation dilemma. Lots of healthcare jobs need to go away, but we can’t just leave those people on their own. It is a thorny problem. I’d like to be optimistic we can solve it, but I don’t see how. Too many entrenched interests will fight the very changes we need to make. So, the US will keep this weight around our national neck as we try to maintain world economic leadership. Maybe we can do it. We’re going to find out. Oct. 17, 2018, 12:12 p.m.
Anecdotal references implying that the US health care system quality and service are somehow superior to other systems doesn’t create an apples to apples comparison either. It may be true that you can find a few statistics where the US system is better, perhaps wait time for certain medical procedures for those who can afford it for example? If you don’t like blanket longevity, take a look at morbidity rates, or death rates for just about any disease and you will find the US rated in a similar locus of many resources being spent with worse outcomes. Oct. 16, 2018, 5:56 p.m.
Are we sure that the outcomes are “better” or just less expensive. Expats visiting US doctors seem to think we get more service and in a more timely way. So are we comparing apples to apples? Blanket longevity tables are a poor comparison due to methods of reporting and diversity of income.